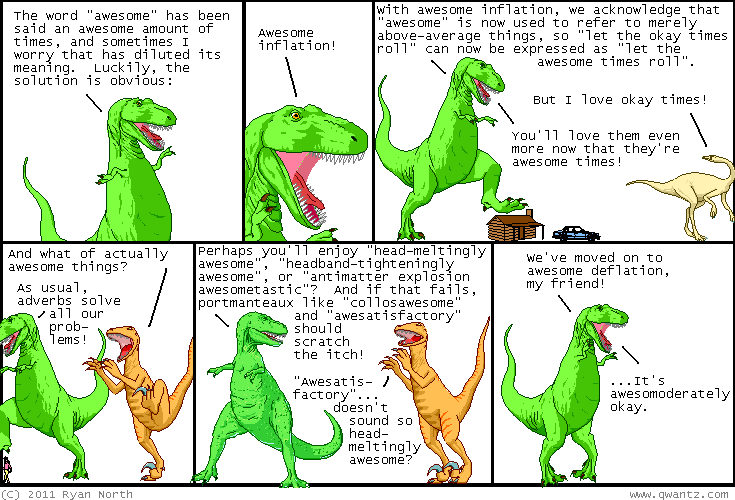 Dinosaur Comics - June 20th, 2011 - awesome fun times! June 20th, 2011: Calgary Comic Convention this weekend was awesome. I met tons of great people, we ran a Machine of Death pictionary game, and I signed a face! Thank you to everybody who came out! I didn't get to see The Guild, but we passed notes between our tables through volunteers, which was fun. I ALSO didn't get to see Two-Takes Frakes but I was in the same room as him, and I can only assume he's writing the same post about ME in his diary somewhere. We're cool!